In this modern world bristling with on-the-go-go-go mobile activity, the dream of an always-available pointing device has long been held as a sort of holy grail of ubiquitous computing. Ubiquitous computing, as futurists use the term, refers to the once-farfetched vision where computing pervades everything, everywhere, in a sort of all-encompassing computational nirvana of socially-aware displays and sensors that can respond to our every whim and need. From our shiny little phones. To our dull beige desktop computers. To the vast wall-spanning electronic whiteboards of a future largely yet to come. How will we interact with all of these devices as we move about the daily routine of this rapidly approaching future? As we encounter computing in all its many forms, carried on our person as well as enmeshed in the digitally enhanced architecture of walls, desktops, and surfaces all around? Enter LightRing, our early take on one possible future for ubiquitous interaction. By virtue of being a ring always worn on the finger, LightRing travels with us and is always present. By virtue of some simple sensing and clever signal processing, LightRing can be supported in an extremely compact form-factor while providing a straightforward pointing modality for interacting with devices. At present, we primarily consider LightRing as it would be configured to interact with a situated display, such as a desktop computer, or a presentation projected against a wall at some distance. 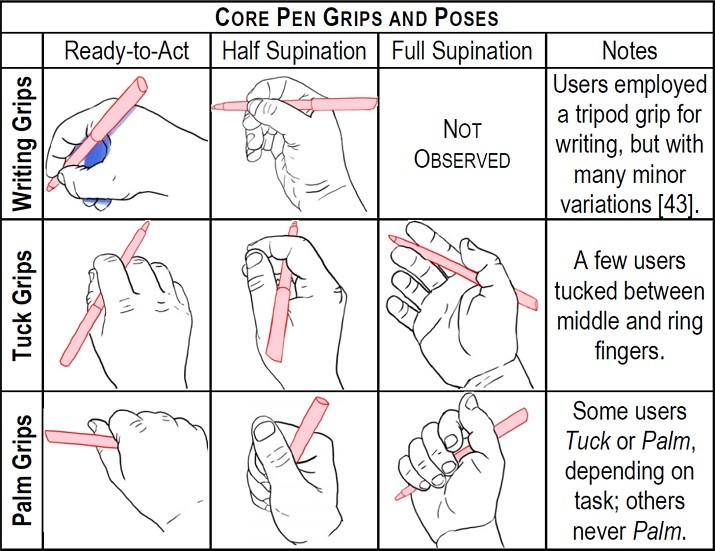 The user moves their index finger, angling left and right, or flexing up and down by bending at the knuckle. Simple stuff, I know. But unlike a mouse, it’s not anchored to any particular computer. It’s a go-everywhere interaction modality. Left: The degrees-of-freedom detected by the LightRing sensors. 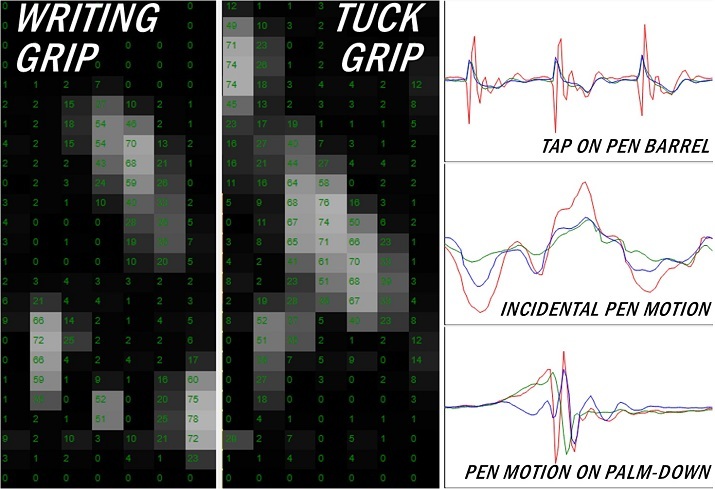 Right: Conceptual mapping of hand movement to the sensed degrees of freedom. 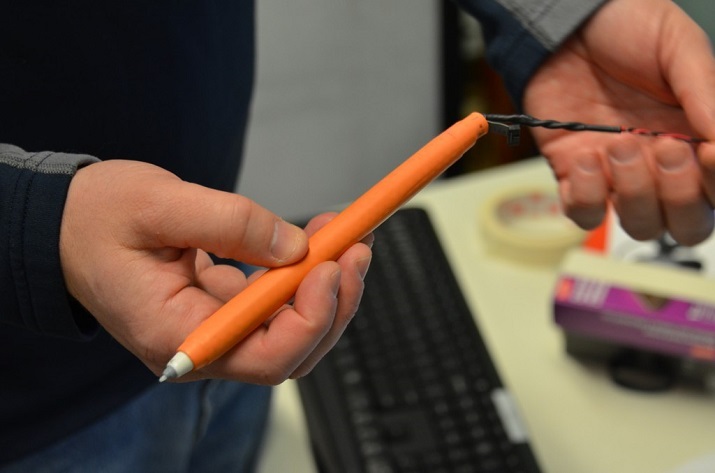 LightRing then combines these to support 2D pointing at targets on a display, or other interactions. 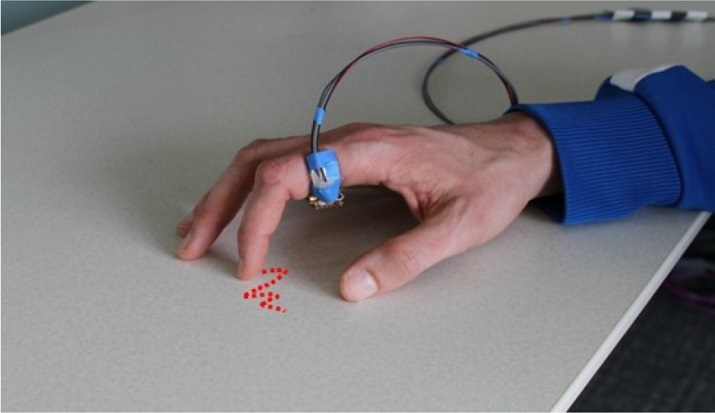 LightRing can then sense these finger movements–using a one-dimensional gyroscope to capture the left-right movement, and an infrared sensor-emitter pair to capture the proximity of the flexing finger joint–to support a cursor-control mode that is similar to how you would hold and move a mouse on a desktop. Except there’s no mouse at all. And there needn’t even be a desktop, as you can see in the video embedded below. LightRing just senses the movement of your finger. 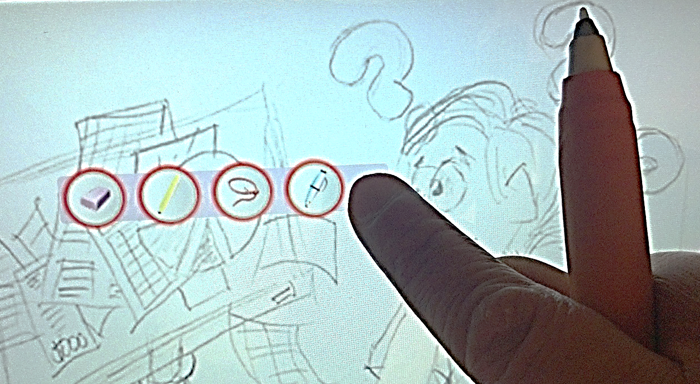 You can make the pointing motions on a tabletop, sure, but you can just as easily do them on a wall. Or on your pocket. Or a handheld clipboard. All the sensing is relative so LightRing always knows how to interpret your motions to control a 2D cursor on a display. Once the LightRing has been paired with a situated device, this lets you point at targets, even if the display itself is beyond your physical reach. 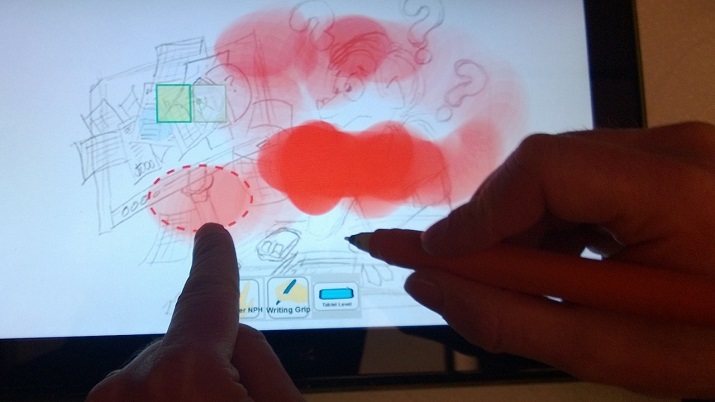 You can sketch or handwrite characters with your finger–another scenario we have explored in depth on smartphones and even watches. The trick to the LightRing is that it can automatically, and very naturally, calibrate itself to your finger’s range of motion if you just swirl your finger. From that circular motion LightRing can work backwards from the sensor values to how your finger is moving, assuming it is constrained to (roughly) a 2D plane. 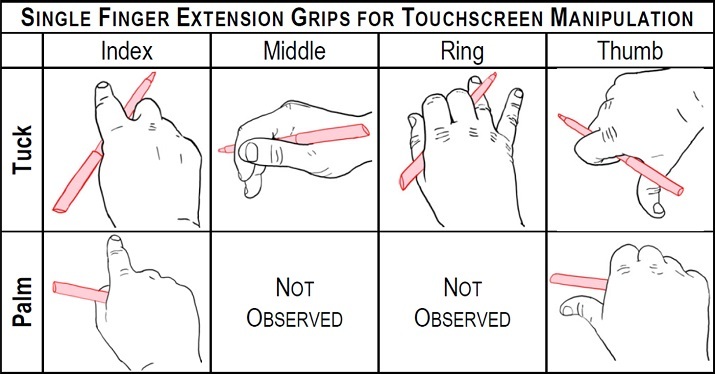 And that, combined with a button-press or finger touch on the ring itself, is enough to provide an effective input device. The LightRing, as we have prototyped it now, is just one early step in the process. There’s a lot more we could do with this device, and many more practical problems that would need to be resolved to make it a useful adjunct to everyday devices–and to tap its full potential. But my co-author Wolf Kienzle and I are working on it. And hopefully, before too much longer now, we’ll have further updates on even more clever and fanciful stuff that we can do through this one tiny keyhole into this field of dreams, the verdant golden country of ubiquitous computing.